The song-poem industry, in which unwitting amateur poets paid to have their lyrics made into actual songs, which were then recorded and pressed onto vinyl in tiny quantities, produced great works of art almost by accident. One of the top song-poem companies was Sterling, which operated out of Boston. Label owner Lew Tobin, a jazz pianist with a warbling wife named Shelley Stuart, always seemed to ensure that his products were decent musically--and given some of the amateur lyrics the musicians had to work with, this was no easy feat. Exhibit #1 in my case is this 1974 Sterling recording, "Do You Know the Difference Between Big Wood and Brush," by Gary Roberts & the Satellites. 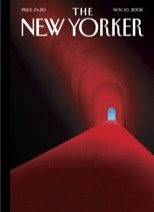 Louise I. Oliver's lyric tells, sort of, the story of a man who leaves his wife for another and returns, having realized that the "brushfire" of illicit pleasures is no match for the "big wood" of a lasting relationship. The metaphor is great, but the lyric is so convoluted that poor Gary can barely get through one line before having to start the next. (The words even mention Thanksgiving, which is why I'm posting it today!) I'm thankful to be able to share music like this with all of you. 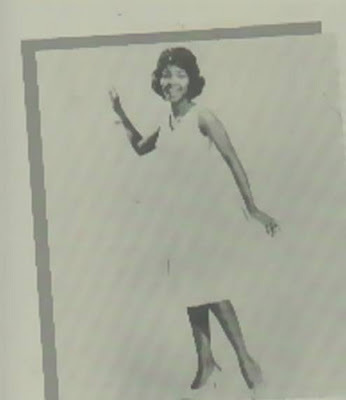 Here's a Chicago soul track by Jan Bradley, a talented singer mostly forgotten today despite enjoying a big hit ("Mama Didn't Lie") in 1963. Ms. Bradley, from the south suburbs of Chicago, hooked up with local powerhouse Chess Records at age 19 in the early sixties. Working with Curtis Mayfield, who was already building a stable of talented local singers and groups, she had access to good material and excellent backing musicians. "Mama Didn't Lie," a sprightly slice of poppy rhythm and blues, took off in 1963, racing up the charts, eventually made the national pop top 20 and the R&B top 10. Unfortunately, Mayfield and Leonard Chess fell out over a royalties dispute concerning the song, and Jan Bradley was denied the ability to again work with Mayfield. Her manager, Don Talty, took over as producer. Never again would Jan Bradley enjoy a major hit. She did, however, write many of her own singles from this point forward, ensuring that she at least picked up a few extra bucks in royalties. My favorite Jan Bradley recording of all is "Your Kind of Lovin'," an unsuccessful 1967 single release on Chess. It was her second-to-last outing for the label. From the very opening--stomping drums and guitar with blaring horns--"Your Kind of Lovin'" has that classic Northern dance beat typical of so much Chicago soul of the period. Vibes, piano, and congas add to the sonic palette. The song itself, co-written by Bradley and Talty, is very unusual, with a snaky, almost Eastern, melody that Ms. Bradley works around in a sultry, playful fashion. The lyrics are tough and imaginative, conveying quite clearly that this affair is over. While a strong soul underpinning is present, this 45 also sports quite a few odd touches. Following an odd, choppy guitar solo (I wonder if Chess session ace Phil Upchurch played it), Talty brings a melodica into the arrangement. And instead of resolving to a major chord out of the last chorus, "Your Kind of Lovin'" fades on a repeating, almost trance-inducing minor-key phrase. The effect is dizzying. This works well both as uptempo, danceable urban pop and as a sort of psychedelic soul, but it's certainly understandable why the 45 didn't sell at the time. It's not particularly commercial, but the whole 2:32 package impresses the heck out of me. It doesn't remind me of anything else ever recorded. Jan Bradley quit the music-go-round in the 70s and moved into social work. One assumes she's better compensated for her hard work. Van McCoy is famous these days for "The Hustle," a fun chunk of Latin disco from 1975. But for 15 years up to that left-field hit, he'd been at the helm of some of the best soul music ever made. McCoy was soul music's triple threat: a terrific producer, songwriter, and singer. He wrote and produced "Baby I'm Yours" for Barbara Lewis (and sang the backup vocals), "Getting Mighty Crowded" for Betty Everett (ditto), Chris Bartley's "The Sweetest Thing This Side of Heaven," David Ruffin's "Walk Away From Love," and "Right on The Tip of My Tongue," an especially sweet joint from Brenda & the Tabulations. He also ran several record labels of his own, including Vando, Maxx, Share, and Arock. 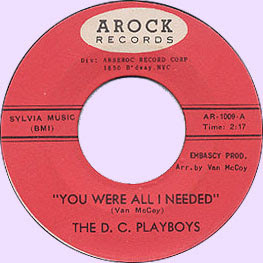 On the last-named label he recorded The Diplomats' "Here's a Heart" as well as today's selection, The D.C. Playboys' "You Were All I Needed." This lovely little teen R&B 45 most likely dates from 1965 or 1966. It is believed that most, if not all, the voices on this record are McCoy's. Not only is this a terrific piece of 60s black pop, it's also one of the first, if not the first, bubblegum records ever. Some state that Jay & the Techniques' "Keep the Ball Rolling," from 1967, deserves this honor. Others have argued in favor of The Monkees or The Music Explosion. But McCoy's product here predates them all, and the imaginative use of handclaps, tinkling celeste, and interweaving backing vocals spells bubblegum to me. See what you think. This record is well known to big-time soul obsessives, but the rest of us ought to hear it, too. Thanks to Ben Pirani for turning me on to it. Lincecum, who captured 18 games for the moribund San Francisco Giants this year, has apparently become the first indie-rock musician to ever win the award. I gotta get off this Beatle-ish record thing! But not until I share another one. Milwaukee's The Ricochetts recorded "Losing You" for the Chicago-based Quill label. This early 1966 single was the group's second of three 45s. Penned by Ricochetts singer/guitarist Ar Kriegel (now known as Ar J. Stevens), "Losing You" far outclasses the Brian Hyland tune placed on the disc's A-side. Combining sweet, simple lyrics and a gorgeous melody, it's worthy of any American Beatle-influenced combo. The jangly 12-string guitar and British-styled harmonies are de rigeur for the times, while the tambourine, careful drumming, and aggressive guitar attack point at a polished, more American approach. Seemingly within weeks of this record's release, times would change, rendering faux Merseybeat as hip as The Twist. The Ricochetts' record apparently sold 10,000 copies in the Wisconsin-Illinois area, but did nothing nationally. Too bad. Ar J. Stevens, however, is still playing music today with his "new" band, Ar Stevens & the Ricochettes. This combo has seen far more success than the 60s version; the new band has backed up many "legacy" artists and toured for several years with Bobby Vee. Nice to see that a rock and roll story sometimes works out!! You can get a CD of the group's new material, plus all three of the original Ricochetts' 1960s singles and b-sides (! ), by visiting this site. I just love records like "Losing You"; hope you enjoy this one too. Here stands history, waiting for us to catch up. I haven't written since the election. Which me would show up here? Would the pissed-off version of me, still not okay with what I saw as unforgivable tactics from the Republicans, gloat in victory? Or could I let that passion wear off? Things are better now. I feel, mostly, a sense of relief that the whole process is over. This was a painful and emotional election campaign, and despite Obama's monumental victory, which came with an uncommonly wide margin both in popular and electoral votes, we still live in a bitterly divided country. Optimistic as I am about President-Elect Barack Obama--and it still feels nice to type that--I am also conscious that this isn't an overwhelming victory for the left. Look at how much went wrong on Election Day. Creepy, discriminatory anti-gay marriage propositions passed in three states. Republican senator Ted Stevens, convicted on seven felony counts by a federal grand jury, may win re-election in Alaska. Al Franken, one of the more progressive people running for Senate, is hoping to win by recount after garnering fewer than 45% of Minnesota's popular vote in the election. Darcy Burner, running for Congress in a swing district in Washington that went 60% for Obama, lost another close race to Dave Reichert. It seems to me that Obama's overwhelming victory came because he was seen as a moderate option to the failed policies of the Bush era, which, like it or not, stuck like Superglue to John McCain. That so many people were able to get past prejudice and vote for a black man is great; that so many people were not is pathetic. We can similarly define "Obama Republicans" as people who would have voted for a reasonable candidate from the right had one been available. Including Sarah Palin on the ticket proved a polarizing choice, and I think that even if it energized the conservative base of the Republican party, the furor around Ms. Palin distracted John McCain's message from getting through. Not that his message was clear or well-expressed anyway. So while I'm glad that Obama is our president--very glad--I am also conscious that the next four years are going to be full of anger, mistrust, lies, and outright racism from some of the 57 million people who voted for John McCain. What the rest of us need to do is respond not with barbs but with strength and vision. It's our chance now. We hoped for this opportunity, so now we have to lead. The first thing I'm doing is really trying to think of new ways to save energy around our place. My 12-year-old nephew reminded me last week that when you're away for a period of time, you should pull plugs from their outlets to save energy. It's not a big step, but it's a step. What ideas do you have to help make change on a daily basis? The song I chose for this post is one of my all-time favorites, and applies to how I feel about America. Big Star's first album, #1 Record, is full of great acoustic songs, and "Give Me Another Chance" hits home every time I consider my own anger and the human capacity for forgiveness. It's one of the few songs that can make me tear up every time I hear it. I want another chance. Let's fix America. ...for the sneering voice-over lady on these last-minute Obama Loves Hateful Preacher Jeremiah Wright ads. Will your newly-earned money be good enough to get you, and the other folks who put this ad together, out of hell?